Our Super 6 Balsamic Box is an incredible collection of our finest aged balsamic vinegars, presented in a custom gift box with Recipe Tips for that perfect present. 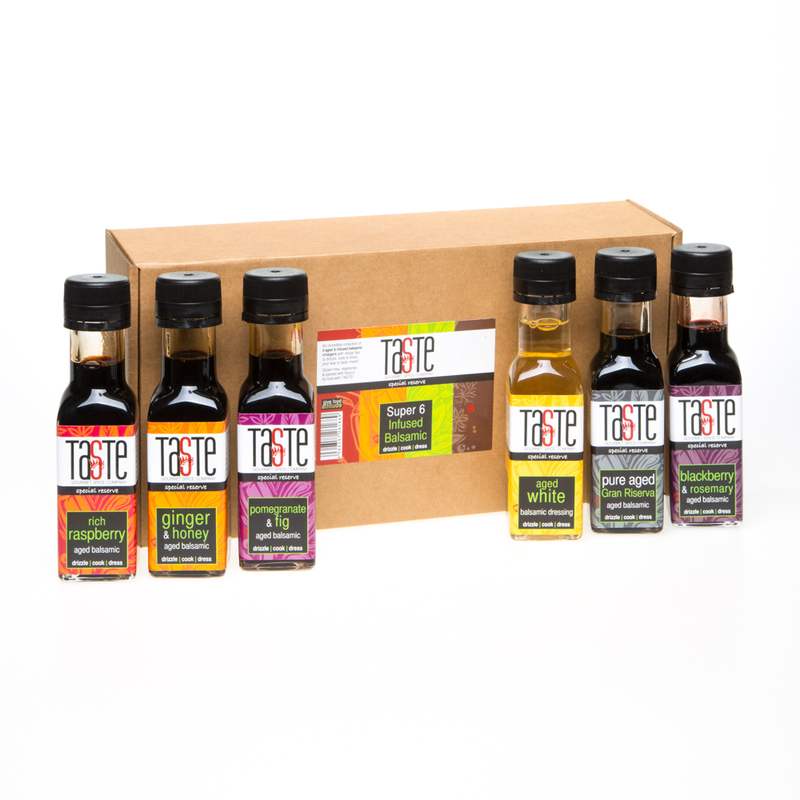 Set contains 6 FULL SIZE bottles, five of our beautiful 'Special Reserve' Aged Balsamic Vinegars: our gorgeous 'Gran Riserva', Rich Raspberry, Blackberry & Rosemary, Pomegranate & Fig and our Ginger & Honey, plus our stunning White Aged Balsamic Vinegar. These are all our new recipe 'Special Reserve' Aged Balsamic & totally authentic, NOT reductions or sugary fruit vinegars containing only some balsamic vinegar. Gran Riserva 'Special Reserve' Aged Balsamic Vinegar: if you're looking for a glaze or a thicker balsamic, our gorgeous 'Special Reserve' Gran Riserva is the one for you! Unlike many others, this is totally natural with no sugar added to the process at all - all the sweetness comes from the passing of time. Use literally a few drops on a salad, meat, veg or sauces for incredible flavour. You simply won't find one at under £10-12 that tastes this good! Blackberry & Rosemary 'Special Reserve' Aged Balsamic: one of our absolute customer favourites, this is a stunning combination of fruit & balsamic vinegars with a subtle back note of herb. Use it as your 'go-to' balsamic: whenever you need to dress a salad, dip chunks of crusty bread into something, drizzle on meats or add a dash to sauces, this is a beautiful aged classic balsamic with a twist to bring it right up to date with today's tastes. It's the perfect partner to goat's cheese salad, roast vegetables or tomatoes, but it really excels when a few drops are drizzled over lamb, venison or any game. Add a few drops to a gravy or jus for an extra special sauce or make a marinade by adding a dash to oil, crushed garlic, thyme and whatever else you fancy: marinate pigeon, lamb or game for a few hours before cooking and you'll create a meal you'll definitely do over & over! Pomegranate & Fig 'Special Reserve' Aged Balsamic: bursting with fresh fruit flavours, the fresh, zingy pomegranate with the added depth of the fig balances beautifully to create a richness not found in cheap copies or sugary fruit vinegars. Rich, thick & sweet with no bitterness, add a drizzle to anything gamey, salads - especially goat's cheese - couscous or quinoa, cheese boards & more. This combination of flavours is destined to be a firm favourite with the discerning foodie. We've even drizzled it over rocket & added it to a pizza before serving. 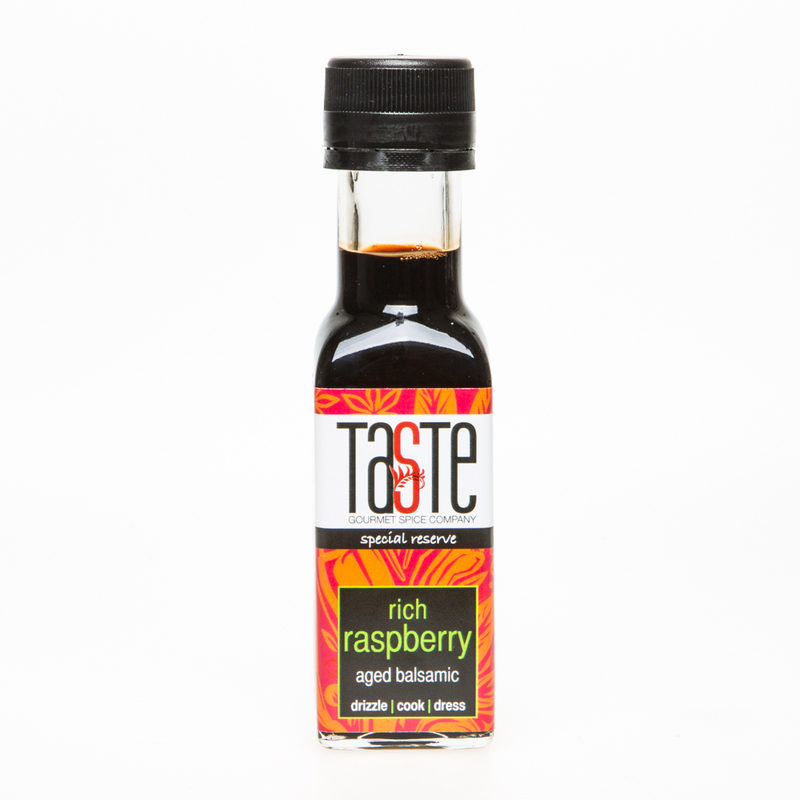 Rich Raspberry 'Special Reserve' Aged Balsamic: Packed with fresh fruit flavours, the tart raspberries are balanced beautifully by the rich, sweet, thick balsamic vinegar to create a taste explosion! Drizzle on meats - especially game or lamb - or add a dash to sauces. We drizzle on salads, fruit, ice cream or even add a shot to prosecco for a twist! Ginger & Honey 'Special Reserve' Aged Balsamic: This infusion of ginger & honey gives a unique flavour profile, working beautifully with sweet meats like pork, pancetta & duck. Rich, thick & sweet with no bitterness, it won't caramelise as easily as the fruit-based balsamic vinegars so is versatile enough to use in cooking; a drizzle when cooking pancetta or roast pork will add an extra dimension of flavour that works beautifully. Add a few drops to a stew, casserole or sauce too. We drizzle it on sautéed greens, right at the end. Add a drizzle to serve with pork instead of apple sauce too. White 'Special Reserve' Aged Balsamic: our award-winning beautiful White Aged Balsamic vinegar is light, fruity & full of fruit flavours. Naturally sweet, we don't add a grain of sugar to this balsamic either, resulting in a bright, fresh dressing, sweet with a hint of creaminess & almost-butterscotch backnotes. A lot of people haven't heard of a white balsamic, and even the ones that have haven't tasted one this good! Drizzle on salads, tuna, scallops, fruit, ice cream or use to balance a ceviche for a lightness that is difficult to achieve using a cheap, sugary-sweet fruit vinegar or one of our traditional, rich aged balsamic vinegars. As a Great Taste Award Winner, the judges said: "Clear, bright, fruity with a well-judged balance of acidity & sweetness. 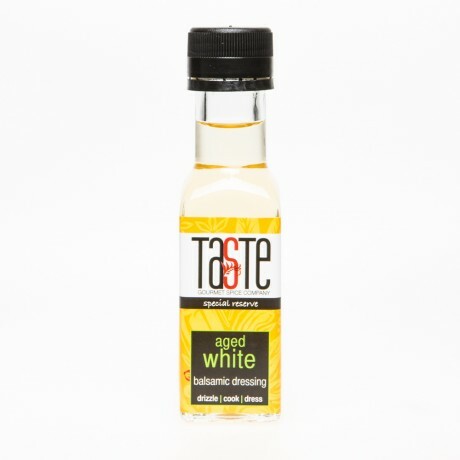 Versatile in its balance & mildness, we liked the grapey-fruitiness behind this beautiful white balsamic. Light, clean-looking dressing with subtle aroma; the flavour is clean & fresh. Well balanced with the sweetness & acidity to give an interesting complexity & length." Presented in it's own special gift box together with a 'Recipe Tips' leaflet for inspiration! This product is dispatched by Gourmet Spice Company. This item has a shipping weight of 2,280g.